Amazon has today announced the launch of its private drone delivery trial in the UK, starting the beta with only two “lucky” shoppers who can now order their goods by drone, TechCrunch is reporting. The retail giant plans to expand the trial to a few dozen and then to hundreds of shoppers, who live within a few miles of its Cambridge Prime Air fulfillment center. Although the first delivery made using Prima Air drone on Dec 7th wasn’t too far from the fulfillment center, it still is a big step for the service, which seemed to be an April Fools’ joke when Amazon first announced it. The drones are loaded in a fulfillment center, and are then rolled out of the hall on rails, after which they take off. The full flight happens autonomously, including the landing, making sure the delivery is made within 30 minutes of ordering. The first product the drone delivered was an Amazon Fire TV and a bag of popcorn. The process took 13 minutes from the time the customer entered the order to the time the package was delivered. 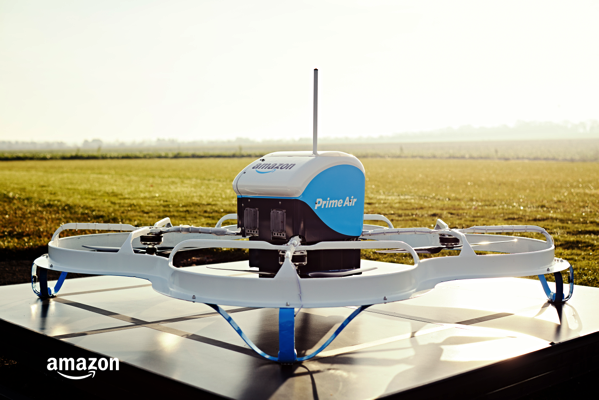 The drones will be able to carry packages up to five pounds. Amazon tells us that the current batch of customers will be able to order seven days a week, but only during daylight hours and when the weather is okay to fly. The drone Amazon is using for these trials is different from the ones it previously showed. It’s a more traditional quadcopter design as opposed to the hybrid plane/quadcopter it showed off last year.